The Moselle River (German: Mosel) is a river which flows through France and Luxembourg, then becomes part of the Rhine River after it flows into Germany. It is 545 kilometres (339 mi) long. 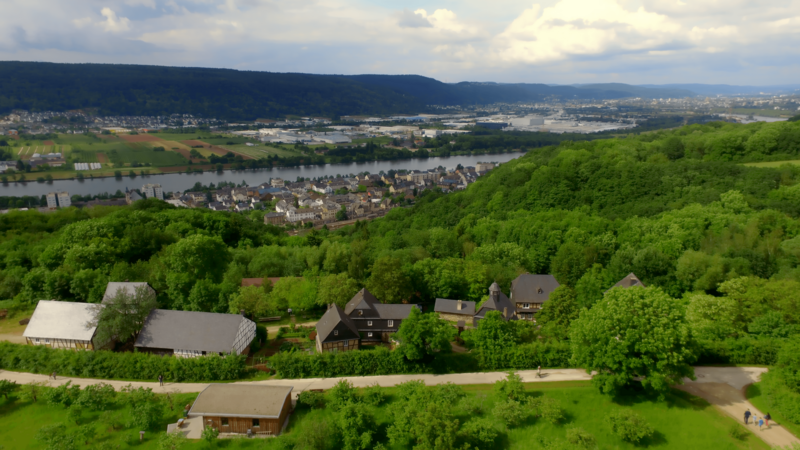 Important cities at the Moselle river are Metz, Thionville, Trier, Bernkastel-Kues and Koblenz. The valley of the Moselle river is famous for the wine of Elbling, Riesling, and Müller-Thurgau - grapes in the wine growing region Moselle-Saar-Ruwer. From the left: Madon, Terrouin, Esch, Rupt de Mad, Orne, Fensch, Gander, Syre, Sauer, Kyll, Salm, Lieser, Alf, Endert, Brohlbach, Elz. From the right: Moselotte, Vologne, Meurthe, Seille, Saar, Olewiger Bach, Avelsbach, Ruwer, Feller Bach, Dhron, Ahringsbach, Kautenbach, Lützbach, Flaumbach, Altlayer Bach, Baybach, Ehrbach. Moselle River Facts for Kids. Kiddle Encyclopedia.